SACRAMENTO — Governor Gavin Newsom today issued an executive order regarding the clemency application submitted by Kevin Cooper, which directs retesting of additional evidence in the case using the latest, most scientifically reliable DNA collection and analysis methodologies. Condemned inmate Kevin Cooper submitted an application for executive clemency to former Governor Edmund Brown, Jr. on February 17, 2016. In 1985, the People convicted Mr. Cooper of murdering Douglas and Peggy Ryen, their 10-year old daughter Jessica, and 11-year old house guest Christopher Hughes. The Ryens’ 8-year old son Josh survived, following critical injuries sustained during the commission of these crimes. In his clemency petition, Mr. Cooper requested further forensic testing of several items of evidence. 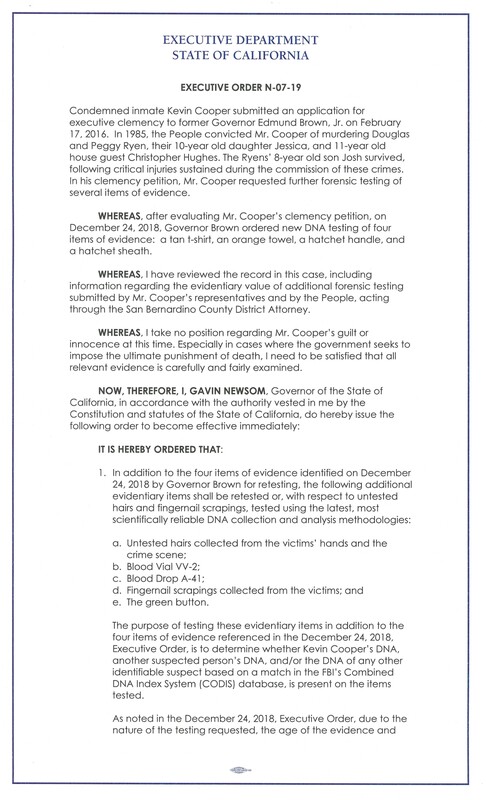 WHEREAS, after evaluating Mr. Cooper’s clemency petition, on December 24, 2018, Governor Brown ordered new DNA testing of four items of evidence: a tan t-shirt, an orange towel, a hatchet handle, and a hatchet sheath. WHEREAS, I have reviewed the record in this case, including information regarding the evidentiary value of additional forensic testing submitted by Mr. Cooper’s representatives and by the People, acting through the San Bernardino County District Attorney. WHEREAS, I take no position regarding Mr. Cooper’s guilt or innocence at this time. Especially in cases where the government seeks to impose the ultimate punishment of death, I need to be satisfied that all relevant evidence is carefully and fairly examined. The purpose of testing these evidentiary items in addition to the four items of evidence referenced in the December 24, 2018, Executive Order, is to determine whether Kevin Cooper’s DNA, another suspected person’s DNA, and/or the DNA of any other identifiable suspect based on a match in the FBI’s Combined DNA Index System (CODIS) database, is present on the items tested. As noted in the December 24, 2018, Executive Order, due to the nature of the testing requested, the age of the evidence and evidence handling protocols at the time of the murders in this case, the parties acknowledge that further testing may yield multiple DNA contributors of unknown origin. Judge Daniel Pratt (ret.) shall retain his appointment as a special master with all of the duties, responsibilities, resources, and authority identified in the December 24, 2018, Executive Order. In carrying out his duties and responsibilities, Judge Pratt shall continue to work under the general direction of the Legal Affairs Secretary. This Order is not intended to, and does not, create any rights or benefits, substantive or procedural, enforceable at law or in equity, against the State of California, its agencies, departments, entities, officers, employees, or any other person. 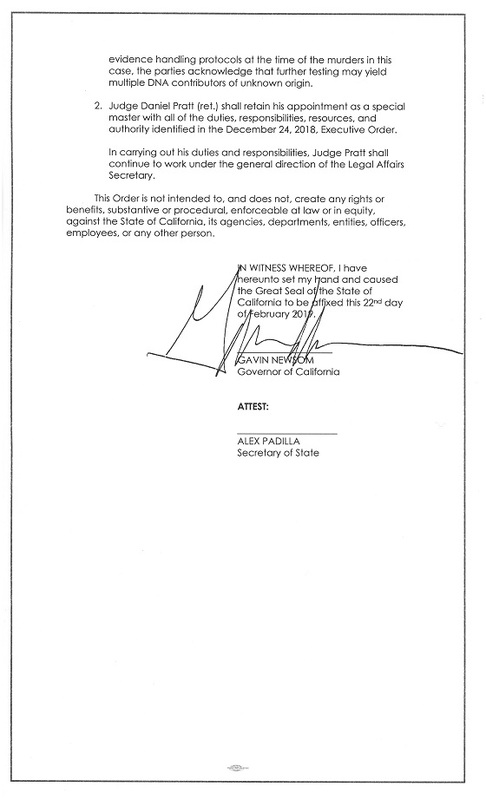 IN WITNESS WHEREOF, I have hereunto set my hand and caused the Great Seal of the State of California to be affixed this 22nd day of February 2019.